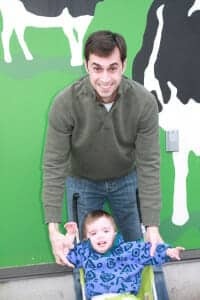 As I sit here, five years into homeschooling and ten-plus years into this parenting gig, it’s easy for me to identify all of the characteristics and traits that have become such a part of our lives and our family story. Early on, we were new parents. We were far too sleep deprived and too in it to recognize any of the signs. Giftedness was not on our radar. At the time, we were so concerned with getting him to calm, to sleep, to eat. We had no idea that the difficulty we were having with those most basic needs might be related to something else. And, later still, once the signs became more apparent, we ignored them so that we wouldn’t come across as That Parent. That is, we ignored them until we couldn’t anymore, until it became obvious to others. And then we ended up suddenly, unexpectedly, homeschooling and everything began to feel lighter. But, the beginning was so hard! The National Association for Gifted Children lists common characteristics and traits of giftedness on their site (and it’s an extremely helpful site for those of you just starting out on this journey!). I thought it might be fun to go through these characteristics and traits, with my 20/20 hindsight. Leo could lift his head within hours of his birth. I can recall the pediatrician coming in to check his vitals that first day or perhaps the next morning (it was such a blur), and Leo immediately starting screaming and arched his back and almost rolled. The pediatrician laughed and said, “Watch out, this one has spirit!” Boy, was he right! This is Leo the morning we left the hospital. Yup, the kid had spirit. He still makes this face, folks. Everyone who met him would joke that he looked like a little old man. I’ll add that he often looked like a grumpy little old man. Even as an infant, he’d lift that gigantic noggin’ and peer toward the source of a conversation, as if he was afraid he was missing something. Later, he could not be put down. The bouncy chair, exersaucer, swing, stroller, car seats, bumbo- those were akin to torture devices for Leo. He’d scream before his little body was even in the thing. 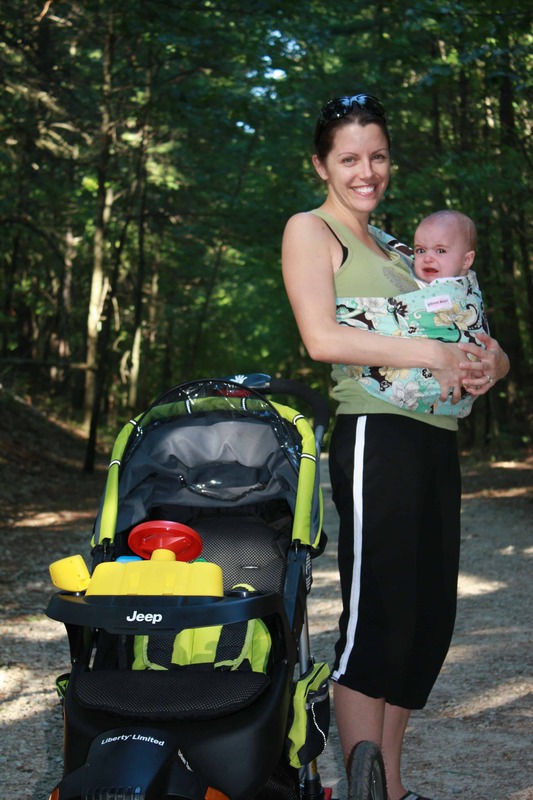 The family that purchased this stroller from us off of Craigslist got a great deal, folks. The child would NEVER ride in it! He has always had a set of lungs on him like no other. He would cry for hours in the car. We stopped going anywhere that required any distance because we couldn’t take it, it was heartbreaking and beyond stressful to travel with him. This is a photo of us at Cape Cod that first 4th of July. I’m still recovering from that three-hour ride, folks! I have SO MANY photos of us like this. I’ve mentioned before that Leo was diagnosed failure to thrive from approximately six months of age until he was just shy of three years old. Therefore, he was a tiny little person and looked much younger than his chronological age. Yet, he spoke in perfect sentences and asked amazing questions. I thoroughly enjoyed his questions, folks, but I’m ashamed to admit that they embarrassed me in public. I cannot tell you how many times we would be in Market Basket or Target, doing our thing, only to have a stranger ask, “How OLD is he? !” and then an awkward conversation would ensue. It happened all the time in those early years. Our tiny little guy had big, huge questions. Yes. If he is paying attention, he’s always been able to learn something of interest to him after the first presentation. 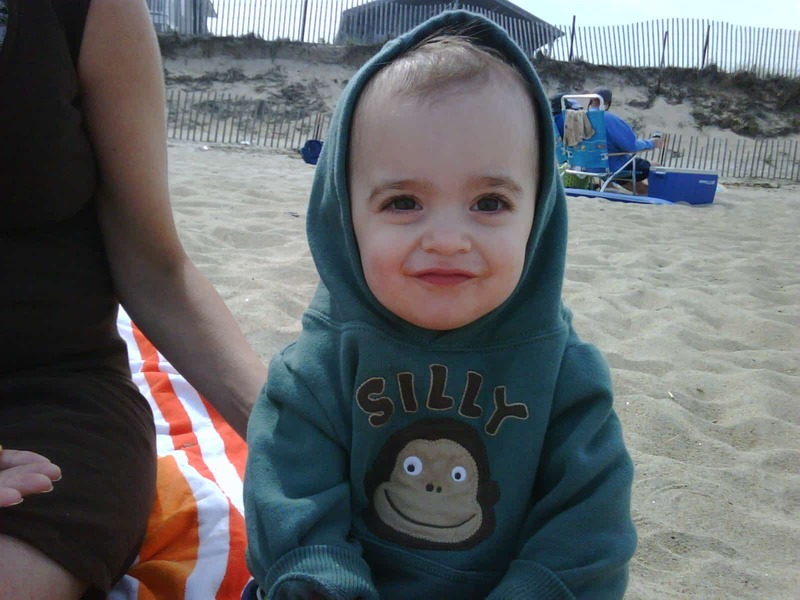 As a baby, he would memorize entire songs very quickly and sing them nonstop for days on end. Oh, yes. I remember when he was just two years old, he was worried about death. And then, at three, he was terrified of extinction. Yes, yes, yes. When Leo was two and three years old he was obsessed with puzzles. He would come down each morning and do a gazillion of them before he would eat his breakfast. And he did them quickly, too. This was the first of MANY puzzles in Leo’s seven years. Leo wrote before he could read. He used to make his own books or copy the words and illustrations of his favorite books. One day, when he was four years old, he woke up from a nap and read an entire book to me. For real. The first time I realized he could read, he read an entire book. That, folks, was when we first started talking about the g-word around here. Anyone who knows Leo in real life is laughing right now. Yes, yes, yes… in a big, huge way. We have so many happy vacation photos like this one here. The child could not [successfully] watch television until he was six years old. I could go on and on about the sensory sensitivities that we dealt with for many years, and continue to struggle with on occasion to this day, but I’ve already done that on this site. To say that Leo is sensitive is a huge understatement. As I was looking for photos for this post, I came across this one. Talk about hindsight being 20/20. On this day, my friend Maria came over for a playdate. I don’t remember why, but she was testing a luggage-weigher thingamajig and we put Leo IN IT because I always knew how much my FTT babe weighed at any given moment. Look how CALM he is there, folks! Any SPD parent will appreciate this photo. He found a safe little spot and I’m sure the weighing action provided deep pressure. 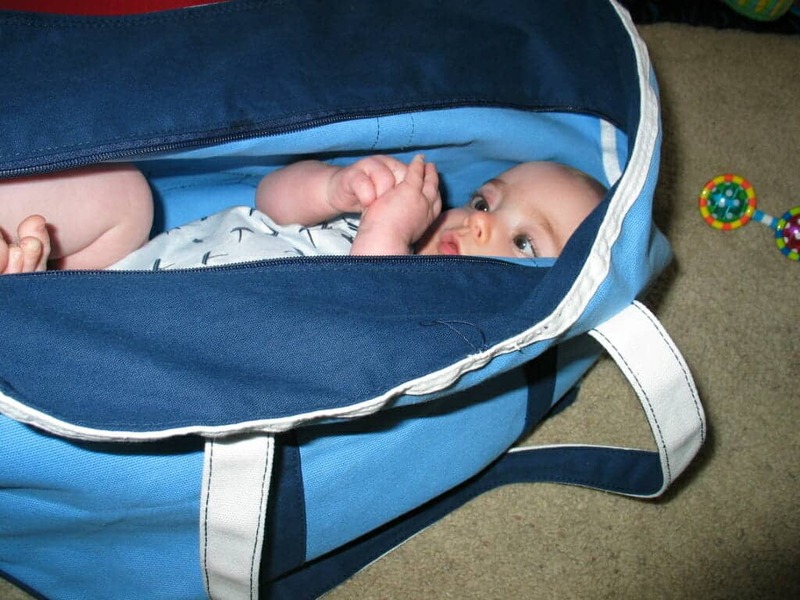 I remember he was so calm that we actually left him in there for a bit as we chatted, occasionally giggling about the fact that my child was snuggled in a tote bag. When he was two, he wondered what frogs do when they get mad at you. When he was three, he wondering if we could become extinct for some unknown reason, just as the dinosaurs had. When he was four, he wondered if our cat (who had just died) would meet Jimi Hendrix in the afterworld. When he was five, he needed to know about infinity. Oh, heck yes. Worried about overcrowding and its impact on certain animal populations? Fear of war? Concern over the ozone layer and pollution? Let’s just say we don’t watch the news around here yet. When Leo is reading or building, you can stand beside him and holler his name and the kid does not flinch. I bet if you had tried to call his name here, he wouldn’t have heard you. I know that look. YES: bike riding, shoe tying, telling time, reading, writing, Roman Numerals, etc., etc. All day long, every single day, since he started speaking in sentences. It’s fascinating. It’s amazing. It’s utterly exhausting. 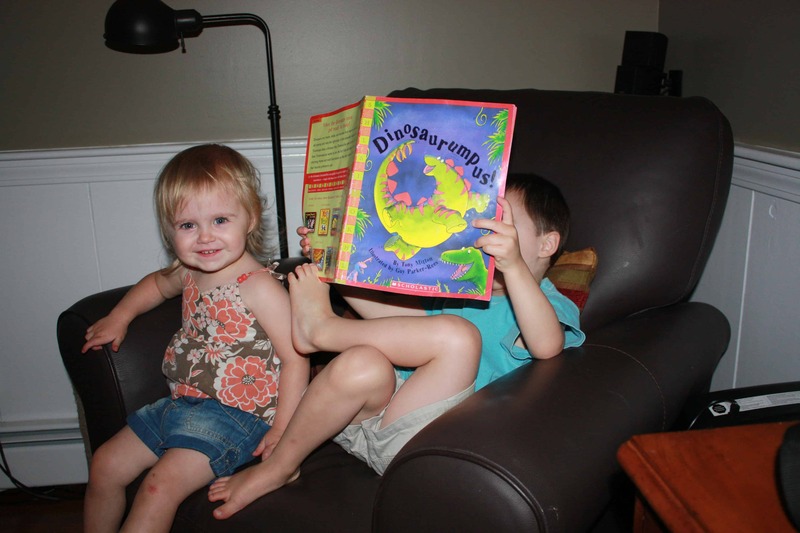 This was the DINOSAUR (and Dinosaurumpus!) phase. From day one, folks! Again, those that know him in real life are laughing at this one. He is a square peg, he marches to the beat of a different drummer, he thinks outside the box. Experiments? You mean like the time he was two and he dismantled his radiator? Or how he could break out of any child-proofing device? How he could climb out of his crib before he could walk? Like how he risked Christmas morning in a quest to determine if his Elf on a Shelf was real? Like his latest interest in wizardry that has resulted in my finding containers of colored liquid all over the place? Um, yes. This was THAT year. The Edgar year. Meeeerry Christmas! Leo is always creating or inventing or planning something, and often he has several things going on at once. Again, those who know him are giggling. Yes. Yes. Yes. And, yes. 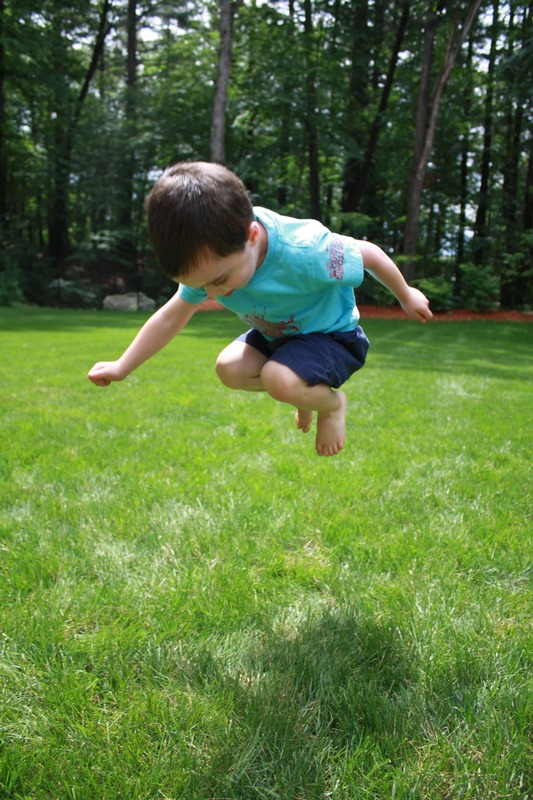 Boundless energy, feet rarely on the ground! Yes, and God help you if you don’t think that his idea is awesome! Oh my, yes. 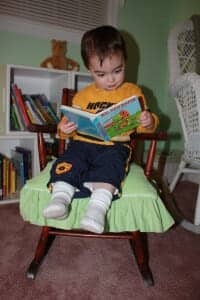 When Leo was younger, before he could read independently, any time someone would walk into our home he would accost them with a book. “Can you read to me?? ?” he would plead until they relented. Again, and again, and again. Yes, we can barely keep up. Thank goodness for our local library! Yes. 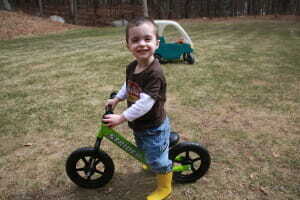 His love of learning and independence helped with our transition to homeschooling. Yes. Perfectionism and frustration related to it have been long-standing issues over here. I wish I could go back to that sleep-deprived new mother, who spent the early days pacing the floors- day and night- with her crying baby. 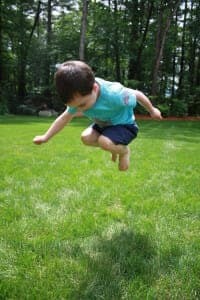 I wish I could talk to that mom who spent every waking hour of those early years trying every trick in the book to squeeze calories into her son only to watch him burn them off immediately. If I could connect with that exhausted, worried mom, I’d hug her. Then, I’d take that wailing baby from her arms and tell her to take a nice, long, steaming hot shower. I’d brew a pot of strong coffee so she could have a cup when she emerged. Before handing her the cup, I’d crack a joke about the fact that she was still rocking and swaying- even without the baby in her arms- and she’d laugh about it. I’d tell her to sit and enjoy that cup of coffee while it was still steaming. As she drank, I’d bounce and shush that sweet, red-faced boy, and I’d tell her that she was doing an amazing job as a mom. She’d start crying into her coffee while I told her that everything is going to be okay. 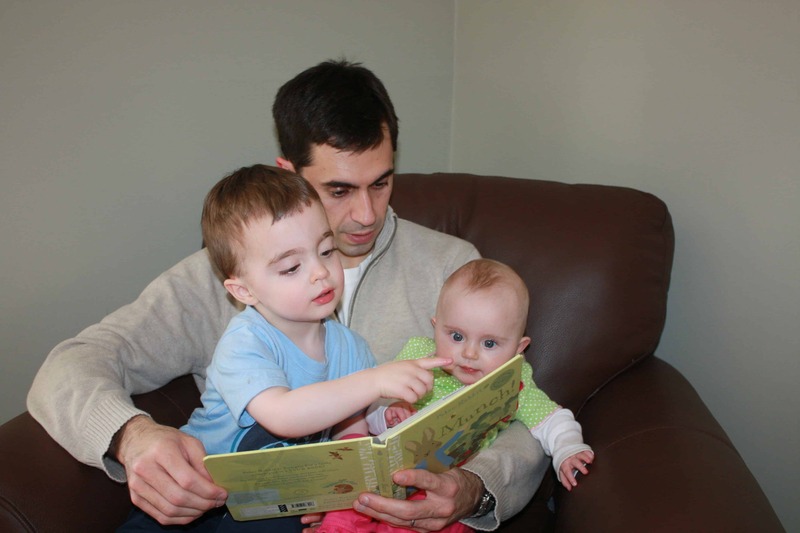 I would be honest and admit that while it would never be easy, it was going to get much, much easier, especially once that little guy could read independently and entertain himself a bit. And I’d assure her that her little boy was anything but a failure to thrive. See this kid? The one with the watermelon all over his face? 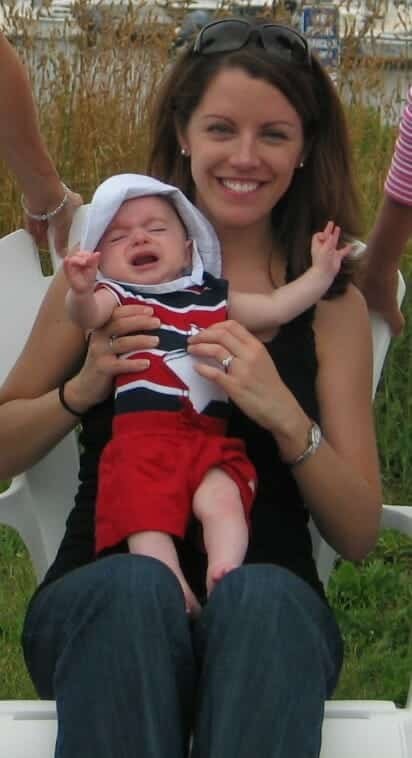 This was the failure to thrive kid who would ONLY eat watermelon all summer long, much to the chagrin of the many specialists we saw in those early years. He’s doing juuuust fine, folks. And so is his mom. Giftedness is a wild ride. Once you realize what it IS (ignoring all those gifted myths out there), and embrace it, it gets easier. I’m thoroughly enjoying this rollercoaster of a ride, with all its many ups and downs and twists and curves. I wouldn’t change it for the world. For those of you just starting out on this journey, you may want to take a look at some of my favorite books and resources here and here. And, if you’re just starting out, be sure to find a community of parents with kids like yours. Believe me, they exist. You are not alone. What about you guys? Where are you on this gifted journey? What has been the most difficult gifted age and stage for you thus far? Have you discovered your own giftedness? You know that proverbial apple? It does not fall far from its tree, folks! Do you see the way giftedness runs through your extended family? Share here! This post is part of the Gifted Homeschoolers Forum April 2015 Blog Hop Gifted at Different Ages and Stages. Click the image below to hop to more posts on this topic from some amazing GHF bloggers! Honestly? People will probably flinch at my saying this but for a period of time, we had to lock him IN his room at night. We switched his doorknob with our bathroom’s doorknob. Why? Because at just-turned-three he was creeping out of his room at night, running the bath water, climbing shelves, opening the front door… at two IN THE MORNING. We tried gates. We tried EVERY child lock that there is. We ended up with a lock. Three almost did me in, not kidding. I hear ya. We never got to that, mostly because a closed door was a major anxiety/panic trigger. I honestly don’t remember how we solved bedtime resistance with #1, but she didn’t sleep through until age 4. #2 was even worse–I’ve read every sleep book, and counseled parents on sleep, and know that the experts say if you do abc the kid will do xyz and then you do 123 and in 3 days you’re DONE. MAYBE a week if you have a persistent child. Mine took 7 weeks to stop screaming all.night.long. Agh! We all needed a change so we stuck to it, but agh! We had to put alarms on all the outside doors for the same escape artist reasons. Thankfully the alarm sound is so aversive to a sound-sensory child that it was a GREAT deterrent and that problem was solved. One of my very seasoned pediatrician partners likes to tell me that my kids “are above the 99th percentile for persistence.” Why yes, yes they are. I can identify with a lot of your post but my daughter also had dyspraxia so she barely rolled on time and avoided puzzles because she couldn’t coordinate putting them together even though she knew what piece went with what. It was too frustrating for her so she didn’t do puzzles for years. Or crafts. Eventually we did OT and PT for the motor issues. It is getting easier now that she’s seven. So much easier. And yet, not. Isn’t it crazy, Michelle? I still think it’s SO HARD… until I look back… and then I realize it’s much easier. Roller coaster ride FOR SURE! I could have written your first paragraph. Every. single. word. Our gifted children are different in many ways, but those first few years before it all starts clicking… Hard to explain it to someone who hasn’t lived it. Cait, I LOVE the photo of him reading the book! You can see the intensity in his eyes (and the pose!)! Isn’t it classic?? It was so fun to look back and SEE it all then. All the same looks, the same intensity. 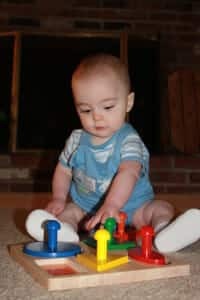 I’m going to share this post/link with counselors who need to find an easy way to understand giftedness in young children. It’s gives such a clear picture. Thanks, Caitie! You provide such reassurance to parents struggling with questions about why their child is so different. We saw many of these qualities in both of our kids, but it took a while to recognize and admit to the giftedness. Thanks for a great post. Thank you for reading, Gail! Loved yours as well! Yes to it all. I had to laugh at the picture of him in the luggage. You are exactly right – any sensory parent will understand! So well said and information. Thank you. Great post, Cait! It brings back a lot of very similar memories for me too! And you are right. 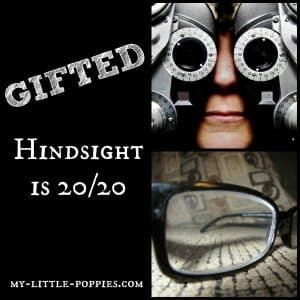 In hindsight you can recognize that all those characteristics that made life interesting and challenging back then were actually the descriptors of giftedness. this whole article was a yep, been there, yep that too. Only big difference was the sensory part. When he was born, he was like most two week olds according to the nurses even holding his head up. I just thought it was because he was a week and a half overdue! Nope, trying to get him to slow down to sleep was a nightmare in itself. The whole childproofing thing was a joke and redirection a million times over was pointless. He would fixate on the TV and working the VCR and yes, at one, he could turn the tv and vcr on, change the channel on the tv to the right one and press play. My friends would say my house is childproof but not Buster proof. I thought oh it’s because he can reach the counters and stuff but no, he did things my brother No No Noah never thought about! My problem was he was so stinkin tall that everyone mistook him for a K when he wasn’t even three and would literally argue with me about how old he was because he spoke like he was six or seven but would totally act like a two yr old. He loves puzzles and maps. Google maps was his friend. Wicked sense of humour but very sensitive emotionally. In grade three his teacher basically called in out in front of the entire class and all us parents there to be readers for the provincial tests got the sarcasm in her voice, most were shocked, but he didn’t even look up and waved his hand like yeah yeah, I heard you. She smiled and the rest of the class took her very seriously about fulling in the bubbles or whatever it was he didn’t do fully. But they had that relationship. She used sarcasm and sense of humour routinely with him because he got it, unlike the rest of his class. He does have two very sarcastic parents so that probably helped but still. Now we struggle with a school division that wants inclusion and an admin that refused to accelerate. Each year I consider homeschooling because then he could do higher math etc. still considering further testing to see where on the scale he fits G wise. And figuring out if sister should get tested as well but also potential 2e kid there. The more I read and learn the better I get at the parenting thing. Not perfect but trying to better keep in mind what he’s facing daily. I love hearing these stories! Your son sounds like mine except taller 🙂 Please keep me posted on your journey- I love hearing about these kids! I know this is an old post, but THANK YOU for writing it. Very similar journey with my son, even down to having failure to thrive the first year. He is an only child who is now 4. He has been diagnosed with a sleep disorder, sensory processing disorder, lack of impulse control, definitely has the exicitabilites of a gifted kid, etc. When I read that paragraph at the end about what you would say to that mother, I just cried (four years later). The first three impossible years are still so fresh in my mind, even though it IS getting easier. Anyway, I found your blog because I am desparately trying to find some community in the Kansas City area as I’ve never found another gifted parent, but I know I need community to find people who understand the journey. Thank you! I forgot to say one thing. 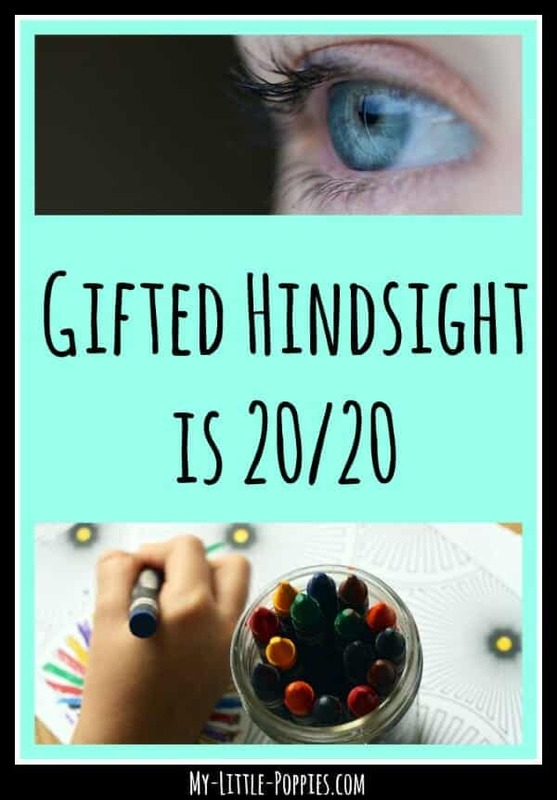 Now that I’ve found information on gifted children and am quite sure he is, I am wondering if all of these things they are finding that are “wrong” with him are just because he’s gifted! I will keep searching out the answers and find community to get the questions answered! Another gifted and FTT mom. Let me tell you: I’ve written plenty about gifted, but the FTT piece of it is still so raw that, while I’ve written about it, it hasn’t left my drafts folder. That was SUCH a hard time. Big hugs to you! As for a gifted group… are you on Facebook? My friend Colleen (from Raising Lifelong Learners) and I created a group for parents of gifted and 2E kids. It is called Raising Poppies. You can find a link to it at the bottom of all my posts. Please join if you are on FB. It’s a fantastic community of parents from around the world and I have little doubt you’ll find someone near you! Thanks so much for your reply. Since I sent my first post, I read more of your blog and found out that your son had silent acid reflux, same as mine! That’s why he didn’t gain weight initially because he wouldn’t eat because of the relux pain. 🙁 Anyway, I am thankful that is over as well and while the FTT was only for a year, it was a LONG year, so I understand a little what you went through and why even now it’s still hard to write about! I am not on Facebook, but I am going to join now. 🙂 I have been resisting all these years, but I know I need to find community for my son, peers that he can relate to, so joining Facebook is a small price to pay. 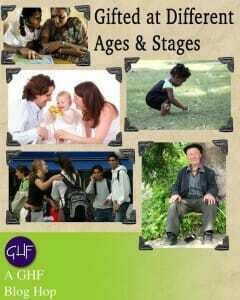 I am looking forward to meeting more parents who can relate to our journey. Many blessings! Wonderful! Let me know if you have any trouble getting in or finding it. We have a couple people checking profiles to be sure they are legit so I’ll watch for you! I’m sitting here in tears because the things you say in this post are word for word things that describe my son. He was different from day 1 as well. Now we’re 2.75years in and the differences between him and other kids his age are becoming more and more apparent by the day. I just want to tell you that I’ve found solace in your blog and the Facebook support group. I stumbled across your blog one night when I was googling how to explain death to my 2 year old. And then everything you were saying about your child resonated. I had never considered giftedness before, but suddenly everything started making sense; the early alertness, the sensitivity, the incredible vocabulary, the cognitive abilities and early interest in things he shouldn’t understand. So anyway, thank you so much for publishing this blog. It has been such a blessing & source of quiet support for me, as I navigate this uncharted journey with my poppy. I do have one question for you, and I hope it’s not too intrusive. Did you figure out why he is/was failure to thrive? My son is too, and we don’t know why and have tried everything. He was 30% below 0 for a while, and we’ve worked really hard for him to be at 0 now. We went from pediatricians blaming me for starving him (not happening) to pediatricians telling us they didn’t know why or that it’s just generics. (My husband is over 6′ and I’m 5’6, so I’m not convinced.) Did you ever figure out why you’re guy was FTT? 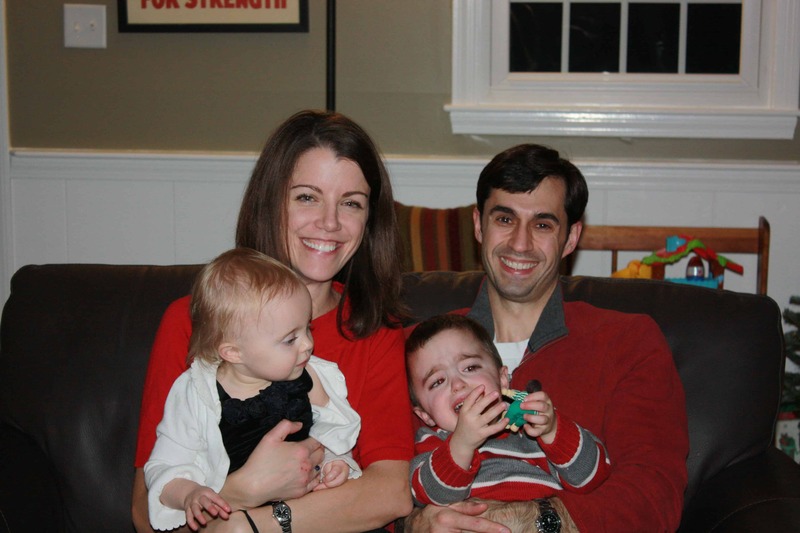 Thanks again for blogging openly about your journey with your poppy. It has been such a help in my life! Your Leo and my Isaac have a lot of things in common. My son regularly slept on his side when he was born. My OB-GYN was so surprised to see the photo. He was walking by 7 months. I bought a ton of baby things that were not used a lot (hello stroller and baby carrier!). He already knew his colors, alphabet, numbers, shapes around that time too. He also likes puzzles. He mastered the Melissa & Doug transportation wooden puzzle at 7 months. My sister, who is a SPED specialist, warned me that the puzzle was too advanced and that I should stick to more simple ones. My son didn’t like them and kept on using the “more advanced” puzzles. He is now 3 years old. 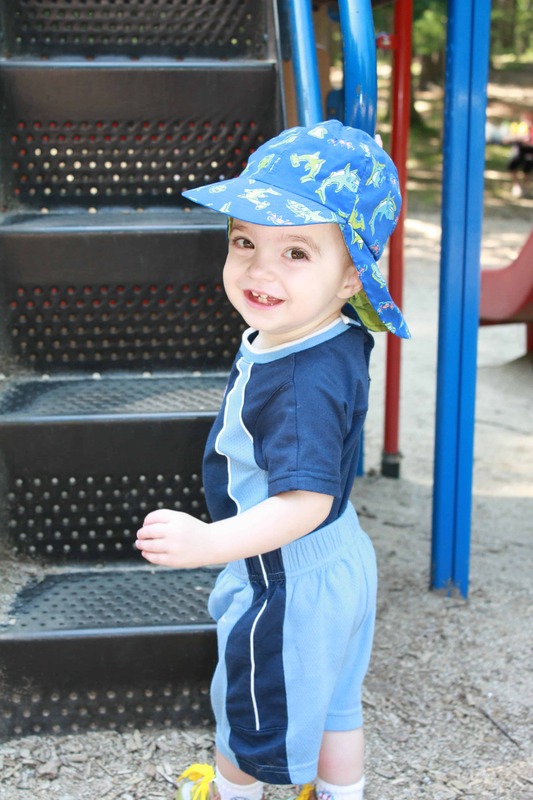 He is twice exceptional (ADHD). I can relate to the constant talking. He is a chatterbox all day, every day. I homeschool him too. He is in Kindergarten 1 and will be accelerated to Kinder 2 probably in November. I can’t stop the boy from learning! I’m the one who gives up! He sometimes asks for lessons during the weekend! He can read and write but most of the time he is lazy/does not want to write. He likes to draw cars and buses though and makes up stories about them. My sister says the laziness to write is because of the ADHD. We go to school once a week to attend a special class for the highly gifted kids in school and he just runs around during the whole 1-hour class but when the teachers ask him questions, he answers them correctly. He is a handful and sometimes he asks for Math drills or activities/lessons at 10pm. 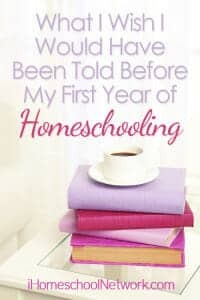 I’m so glad there are blogs like yours where I can find tips about homeschooling/parenting a 2E child. There are no support groups in my country and blogs like yours keep me sane. I know you know what I mean. =D So thank you! This all sounds so familiar! I’m sorry you don’t have support nearby. Have you joined Raising Poppies on Facebook? It’s a closed group for parents of kids like ours. Lots of kindred spirits! Love your story, Amy! Are you in our Raising Poppies FB group? It helps! This sounds like our daughter!!!!! If you don’t mind me asking, why was he diagnosed with FTT? Our daughter gained not a single ounce from 6 months to 18 months (I still remember the first time she swallowed something besides breastmilk-but-never-from-a-bottle-only-me, it was a goldfish at 17 months after watching all the other kids at VBS eating them and wanting to be just like them. After that she finally started gaining weight). Our doctor just said, She’s happy and healthy in every other way, we’ll just give her time. But she was never fussy during that time, so that made a big difference in our worry levels. 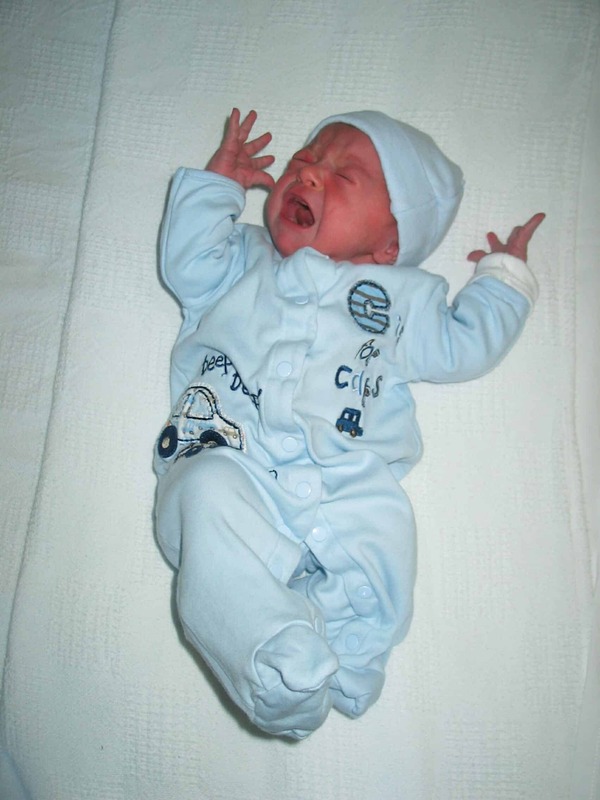 It was severe silent reflux and a dairy intolerance. I’m so glad that you’re daughter is gaining weight now. It can be such a stressful time!